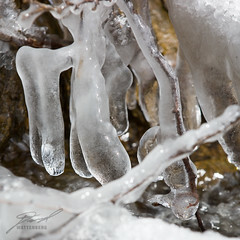 Ice Coat While out Geocaching with our friends TeamLegend4 we happened across a small river of sparkling water and ice coating the branches of the limbs that had fallen in. We spend several minutes shooting, but without a tripod I wasn't going to get the shots I really wanted. Why didn't I bring the tripod? Oh yeah -- I would have had to carry it for more than 2 miles out and back along with the camera, bag, and up and down the nearly 100ft elevation changes. Not a huge deal if I hadn't been out of shape from the winter.